It was warm here in Utah, and then it wasn’t. Surprise Surprise. haha! Typical spring weather for this state. I love my slow cooker, especially during colder days. It brings wonderful comforting smells that fill my home all day long, making it feel extra cozy. This recipe comes from one of my favorite cookbooks, 365 Days of Slow Cooking. It is a wonderful cookbook done by Karen who blogs at 365 Days of Slow Cooking. Her recipe says to cube the chicken before putting it into the crock pot, which I am sure would be fabulous to have bit size pieces. I just like as little handling of raw meat as possible, so I just stuck them in whole. Either way will be fine and still turn out great! The recipe is WONDERFUL! It was so flavorful and creamy. We topped ours with some bacon and it added to the delicious taste. This is a family approved recipe in our home! Yum! I love these flavors and am excited to try this! Beautiful picture! Will definitely be trying this! Sounds delicious! 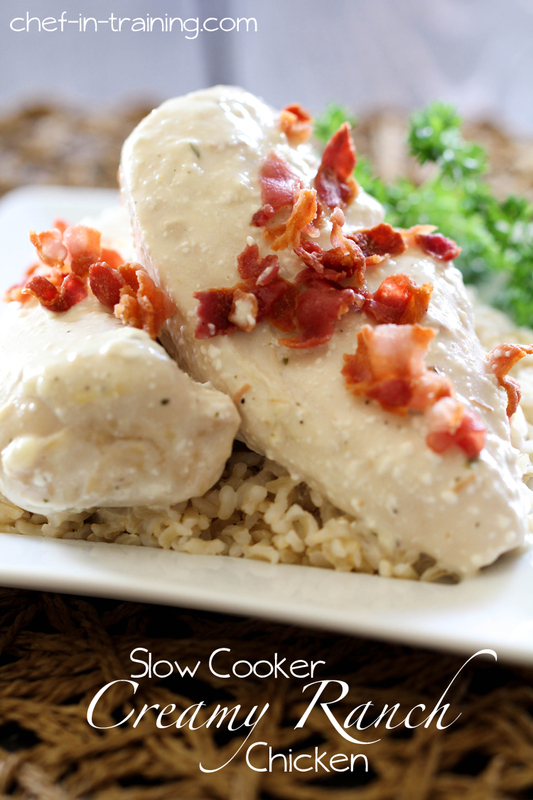 Thanks for sharing this recipe from my cookbook and linking back to me. Love the addition of bacon!! I made this exact meal tonight only with pork chops & over potatoes! My husband raved about it (which he usually doesn't do because he will eat anything!). I'll have to try your recipe with chicken because I'm not always a big pork fan. I also didn't have any cream of mushroom on hand so I made cream of celery from scratch and was so surprised how easy it turned out! Going to have to try this very soon. I love that it is all simple (to find) ingredients!! Gotta love our yo-yo weather here in Utah! This recipe is a must try! Seems we all have enjoyed it so far! Thank you. I really enjoy your blog and recipes! We had this for dinner tonight, it was beyond delicious! Even my picky four year old loved it! This is going into the recipe box for sure! Did you use frozen or thawed chicken breast?